Murphy was relatively new to the tattoo scene. He arrived in Winston Salem in the summer of 2014 from Virginia Beach where he was found wandering with no apparent direction in life. We offered him a one year apprenticeship at the Archive in our security division, which he sucessfully completed in July, 2015, earning the title "Big Dog - Chief of Shop Security". As Chief of Shop Security, Murphy is responsible for opening the shop with the assistance of the BookMistress, making his presence known, generally keeping an eye out for anything suspicious, alerting the owners when someone comes into the shop and eating cookies and napping. 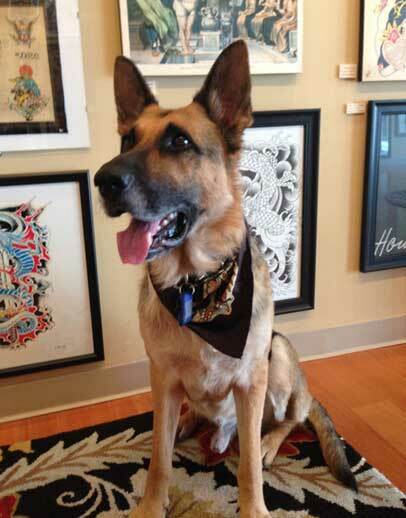 Please come by and say hi to Murphy when you're visiting the Tattoo Archive.